Greetings from Hong Kong. Whenever I am here it usually means I am coming or going from a big trip. I was here last October and now I’m heading back to Saigon after a couple of months of travel. When I visit Hong Kong I often stay at the Chungking Mansions. This time I am staying near the Jordan MTR Station, which is only one stop away from Tsim Sha Tsui (the area near the harbour). There is a great night market (Temple Street) and a food market (Reclamation Street) which gives the area a more local feel. 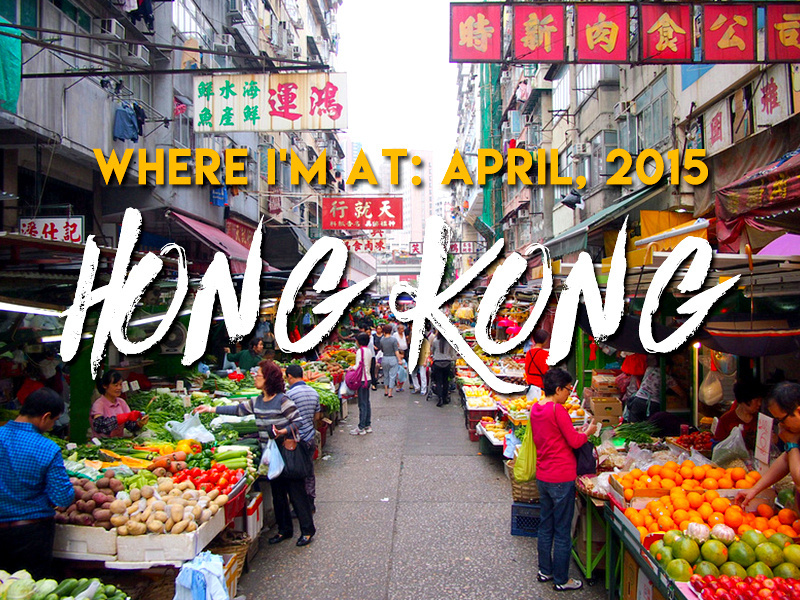 If you’re not sure which area to stay in Hong Kong check out my Where To Stay Guide. I’ve recently started using Foursquare to find places to eat, especially when I don’t have time to walk around to find a place. I discovered near where I’m staying the Dim Sum Specialty Store, which was listed as one of Newsweek’s Best Places To Eat In The World. I haven’t eaten enough dim sum in Hong Kong to tell you if it’s the best, but it was indeed delicious. One thing I noticed there was that they have an Instagram account. Given how common it is for people to photograph food (especially in Asia) I’m surprised that more restaurants don’t do this as it is the cheapest (free, actually) form of marketing. I was in Melbourne at the start of the month and from there I went back to Bangkok. In my last update I alluded to a planned trip, which at the time was not confirmed. The trip was confirmed and it was to Namibia. Visiting anywhere in Africa in 2015 wasn’t even on my radar a month ago. I was invited by the Namibian Tourism Board at short notice, who asked if I wanted to visit the filming locations of Mad Max 4 (Mad Max: Fury Road), which was shot here recently. Having lost count of the amount of times I have watched the first three Mad Max films in my youth, my answer was hell yes! I Arrived at Windhoek International Airport on Namibia’s 25th anniversary of independence. There was a United States government plane on the tarmac, and fighter jets were doing flyovers as we disembarked, which gave this little airport more buzz than usual. At immigration I was greeted by a woman wearing a bright orange dress, giant fake pearls around her neck, and a wonderful smile. I thought I wouldn’t be able to top my last friendly immigration experience so soon, but she has rocketed up the charts of my rankings for best ever immigration official. The airport is 45 km from Windhoek and the terrain to the city is undulating and arid. Namibia is one of the least densely populated countries in the world, and you get a sense of that by driving from the little airport to its capital city with a population of just over 300,000 people. The empty landscape reminded me a little of my sparsely populated homeland of Australia. Getting to Namibia involved three fights from Bangkok, via Hong Kong and Johannesburg, where I transited through Johannesburg’s Tambo International Airport. I’ve never been to South Africa, and airport visits don’t count, so I still haven’t been to South Africa. Even though a transit is not a visit the transit counter stamped my passport, which has never happened at any other transit airport I’ve been to. During my couple of hours of transit time at Tambo I was looking at the departure board and all the destinations I never see at Asian airports: Brazzaville, Livingstone, Luanda, Lusaka, Victoria Falls. Each destination reminding me that I have this giant continent that is yet to be explored. While I no longer have the time or inclination to do a long-term overland trip around Africa, I could see myself doing smaller one or two week trips to specific places. No need to rush around and see everything, when a week somewhere would be just as invigorating an experience. I already feel like this little jaunt to Namibia is going to whet my appetite for more African travels. I’m on my way back to Saigon where I will rent a room for a couple of months and get back to work. My next travel plans are for Europe in June but other than that it will some regional Vietnam travels. I was travelling for most of the last month so I was light on the blog posts. The food market looks pretty good fresh fruit and veggies.